Mrs. Veronica Penny is very happy to be teaching third grade again at Divine Wisdom Catholic Academy. 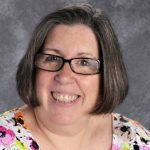 She taught in the Diocese of Rockville Centre for nineteen years, at Long Beach Catholic School and St. Joseph School in Garden City. She has taught Pre-K through eighth grade and was a school librarian for eight years. A graduate of Adelphi University, with a Masters’ degree in early childhood and elementary education, Mrs. Penny lives in Merrick with her husband and three children who are in college and high school. Mrs. Penny enjoys watching her daughters participate in dance and is a big fan of her son’s soccer teams. She is looking forward to another great year working and growing with the third graders at DWCA!